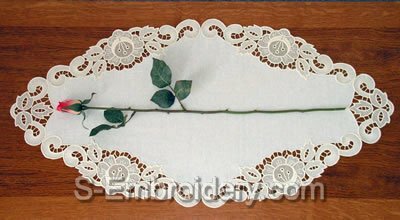 This set of 2 freestanding lace machine embroidery designs will let you create beautiful doily that you could complement with rectangular place mats (an example of a place mat is shown below the images of the doily). 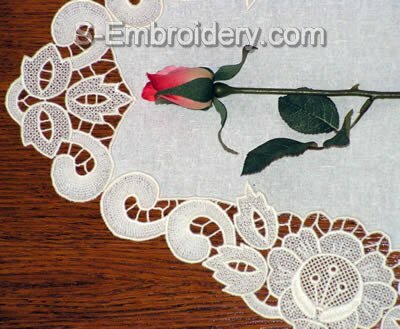 The designs can be used both in combination or independently to fit other lace embroidery projects. 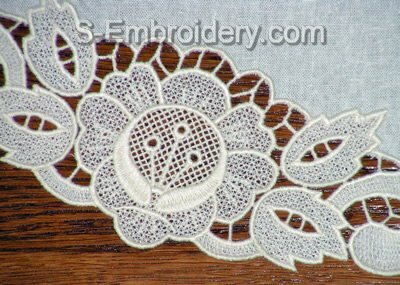 One of the designs is split in 3 parts in order to fit in hoops, so you receive 4 machine embroidery files in your preferred format and design information and instructions for creating the doily, featured on our web site, in PDF format.